On July 10, they sold three different types of delicious lunchboxes for 198 YEN in Hyogo prefecture, Kakogawa town, with rice and five pieces of side dishes, for example fried fish or a large croquette. There is a real war out there for cheaper and yet better lunchboxes. Those old ones of Negoro laquer are especially famous.
. jikirou　食籠 jikiro - lidded food container . They could be thrown away after finishing lunch. A traditional black-lacquered Japanese bento box. since the Heian period, made of thin sheets. Usually with a lid. A kind of magewappa. "lunch prepared by a loving wife"
Prepared by the housewife for her family early in the morning. Most condiments are sold as frozen food to make things easier nowadays. Many workers carry a kind of thermo with three layers for rice, sice dishes and a container for miso soup, whith all food kept warm until the lunchbreak. From the Gion Quarter of Kyoto. Yuba tofu skin, Nanbanzuke pickles, kuruma ebi shrimps, local chicken. Prepared since the Edo period to be enjoyed whilst watching the village kabuki. Each household prepares its own in laquer boxes with the family crest, so when they share some boxes it will always come back to its owner. Salted squid, chikuwa, green beans (ingen), pumpkin and other seasonal vegetables, altogether six (roku) items, hence the name. Mixed Rice (mazegohan) was added in one layer of the box. Since the village is sourrounded by high mountains, it was impossible to get fresh fish.
. . . CLICK here for more kabuki Photos ! 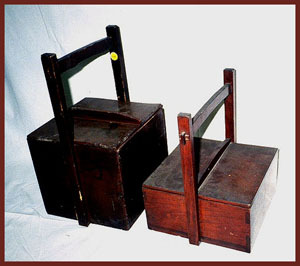 WARIGO is the name for the wooden box of each family. A performance each year at the shrine Hachiman Jinja was the stage for a village kabuki. Sometimes more than 250 meals were prepared for the village and the actors. Rice was cooked, as sushi or Inarizushi. Cooked food was konnyaku, lotus, chikuwa, carrots, goboo, konbu and dried radish. chuuka bentoo 中華弁当 with Chinese food. "bento like the Japanese flag"
only white rice and a red pickled plum (umeboshi) in the center.
. hinomaru, hi no maru 日の丸 the Japanese Flag . makunouchi bentoo 幕の内弁当 "eaten between the curtsins" during a Kabuki performance in Old Edo. with a slice of salmon, an eggroll, pickled plums and other traditional fair.
. . . CLICK here for Photos ! It will make your mouth water ! noriben 海苔弁 slices of nori dipped in soy sauce cover the cooked rice. A very simple form for busy mothers. Restaurant, das Essen auf Bestellung liefert. The Shidashiya of Kyoto are especially famous. They cater for private events and also deliver to temples and tea masters. Many prepare most of the food in their own kitchen and then go to the temple kitchen to prepare a hot soup or cook rice ready eat at the tea ceremony right to the minute. Many have a long tradition with their customers and wooden boards with the names of their client temples, for example, hang at their entrance. They often have long discussions with a priest or tea master about the food, which must be seasonal and beautifully arranged on special dishes. shidashi bentoo 仕出し弁当 made in a restaurant and delivered for lunch at special occasions, like a funeral or meeting. usually with a lid or doors a the side and various shelves to store the food. oka means "hill", maybe a distortion of oke 桶 bucket. Or the food is heaped like a mountain "oka" inside.
. Okamochi for delivering sushi . Since 2003, even airports serve special bentos for their visitors with local specialities, to be eaten on the spot or taken home as souvenir. Bentō (弁当 or べんとう, Bentō) is a single-portion takeout or home-packed meal common in Japanese cuisine. A traditional bento consists of rice, fish or meat, and one or more pickled or cooked vegetables as a side dish. Containers range from disposable mass produced to hand crafted lacquerware. Although bento is readily available in many places throughout Japan, including convenience stores, bento shops (弁当屋, bentō-ya), train stations, and department stores, it is still common for Japanese homemakers to spend considerable time and energy producing an appealing boxed lunch. 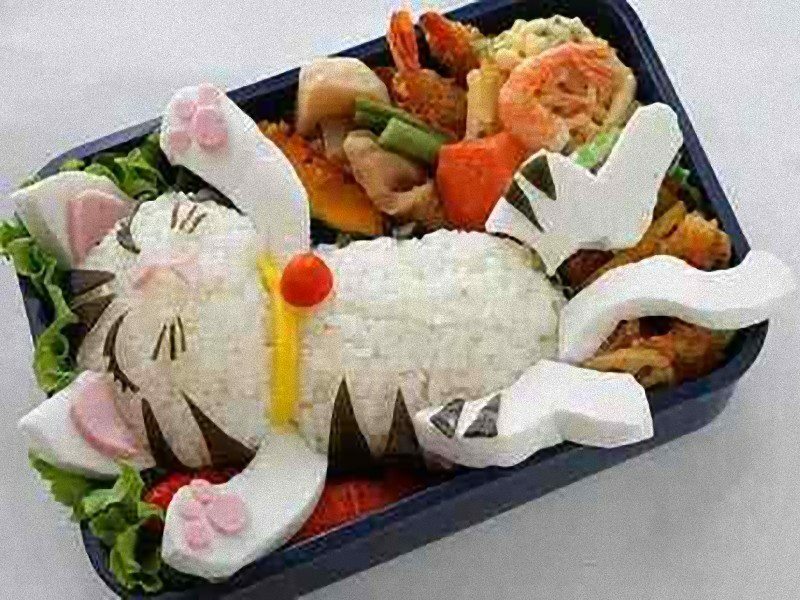 Bento can be very elaborately arranged. Contests are often held where homemakers can compete for the most aesthetically pleasing arrangements. 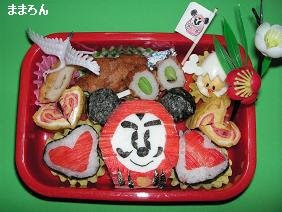 The food is often decorated to look like people, animals, or characters and items such as flowers and plants. This style of elaborate bento is called kyaraben キャラ弁 (kyara : character bento). 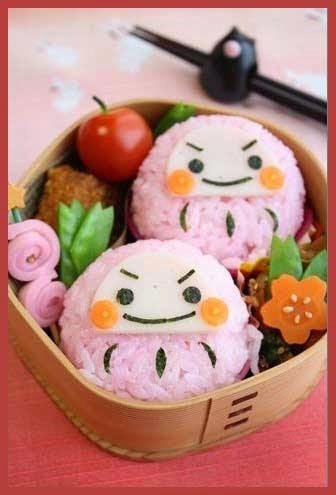 The origin of bento can be traced back to the late Kamakura Period (1185 to 1333), when cooked and dried rice called hoshi-ii (糒 or 干し飯, literally "dried meal") was developed. Hoshi-ii can be eaten as is, or can be boiled with water to make cooked rice, and is stored in a small bag. 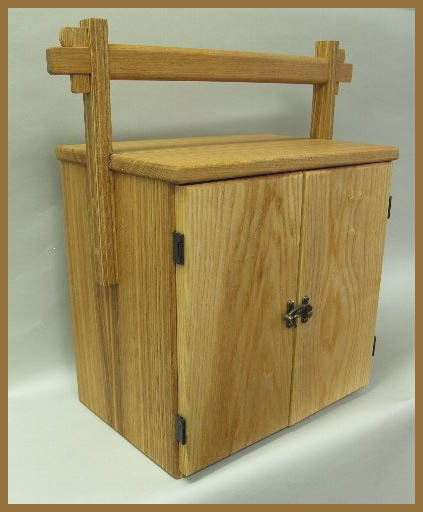 In the Azuchi-Momoyama Period (1568 to 1600), wooden lacquered boxes like today's were produced and bento would be eaten during a hanami or a tea party. In the peaceful and prosperous time of the Edo Period (1603 to 1867), bento culture spread and became more refined. 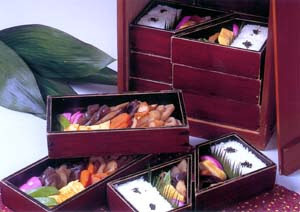 Travelers and sightseers would carry a simple koshibentō (腰弁当, "waist bento"), consisting of several onigiri wrapped with bamboo leaves or in a woven bamboo box. One of the most popular styles of bento, called makuno-uchi bentō ("between-act bento"), was first made during this period. People who came to see Noh and Kabuki ate specially prepared bento between maku (acts). Numerous cookbooks were published detailing how to cook, how to pack, and what to prepare for occasions like Hanami and Hinamatsuri. In the Meiji Period (1868 to 1912), the first ekibentō or ekiben (駅弁当 or 駅弁, "train station bento") was sold. There are several records that claim where ekiben was first sold, but it is believed that it was sold on 16 July 1885, at the Utsunomiya train station, and contained two onigiri and a serving of takuan wrapped in bamboo leaves. As early schools did not provide lunch, students and teachers carried bento, as did many employees. A "European" style bento with sandwiches also went on sale during this period. In the Taishō period (1912 to 1926), the aluminum bento box became a luxury item because of its ease of cleaning and its silver-like appearance. Also, a move to abolish the practice of bento in school became a social issue. Disparities in wealth spread during this period, following an export boom during World War I and subsequent crop failures in the Tohoku region. A bento too often reflected a student's wealth, and many wondered if this had an unfavorable influence on children both physically, from lack of adequate diet, and psychologically, from a clumsily made bento or the richness of food. After World War II, the practice of bringing bento to school gradually declined and was replaced by uniform food provided for all students and teachers. Bento regained its popularity in the 1980s, with the help of the microwave oven and the proliferation of convenience stores. In addition, the expensive wood and metal boxes have been replaced at most bento shops with inexpensive, disposable polystyrene boxes. However, even handmade bento have made a comeback, and they are once again a common, although not universal, sight at Japanese schools. The Bento is still used by workers as a packed lunch, by families on day trips, for school picnics and sports days etc. The Bento, made at home, is wrapped in a furoshiki cloth, which acts as both bag and table mat. In 2003, airports started offering an analogous version of the ekiben: bento filled with local cuisine, to be eaten while waiting for an airplane or during the flight. Issa recopies it in Oraga haru ("My Spring") with the prescript, "Taking pity on a beggar at Zenkoo Temple's gate." The mon was the basic currency of Issa's time. It took the form of a coin with a hole in its middle so that it could be strung on a string. According to Shinji Ogawa, a bowl of noodles in Issa's day sold for 16 mon: the equivalent of approximately four or five U.S. dollars today, which would make one mon = 25 - 27 cents. In the haiku, 4-5 mon would equal a little more than a dollar today.